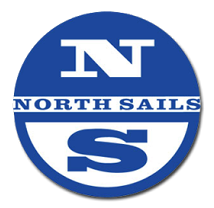 If there was a category at the Academy Awards for "Best Sailing Video," these guys would get our vote! Here's another cool perspective with great music from the crew aboard "Free Bowl of Soup" from this year's 2016 CYC Oregon Offshore International Yacht Race! 2016 Oregon Offshore from Shortcake Photography on Vimeo. These guys are a formidable looking "crew" for sure! Happy Ending For Panama Red on the 2016 CYC Oregon Offshore! Click here for a jib-jab video of the crew taken in town later that night! They were sure happy! 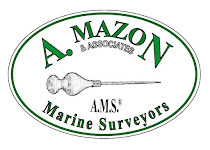 A big thanks to our sponsors; to Tom Keffer, Gregg Bryden, and Mike Cassinelli and the Coho Sally for the work at the start; to Eric and Kim Rimkus, Gary Bruner for their work at the finish line; to Naomi Reichman, Kelsey Friedman, Heather Zieser, and Joe Hoffman, your hospitality crew; and to Charlotte Gann, Vern Burkhardt, Dennis McMillan, and Robert Johnson for the tracker support and awards BBQ; to Eric Rouzee for the outstanding Oregon Offshore logo. Let's not forget our master-blogger, keeping you all informed and entertained... Flamingo Chris Christensen from Portland, OR. Well done and a million thanks, Chris. Yet another classic "race within a race" on this year's CYC Oregon Offshore International Yacht Race was the competition in B fleet between the Santa Cruz 27 Blade Runner, and the Cascade 36, Raindrop. From a design perspective, you really couldn't find two more divergent boats...one built strong and steady for solid performance in NW waters, and the other, an ultra-light "mini sled" designed by one of the greatest "wizards" in the history of modern racing yacht design, Bill Lee. This isolated competition was interesting from a number of perspectives...the end result - as most now know - is that Raindrop finished ahead of Blade Runner, but Blade Runner saved their time on Raindrop after the time allowances were calculated. Blade Runner won this year's race - first overall in Class B & First Overall in PHRF; Raindrop was 2nd in Class B & 2nd Overall in PHRF. 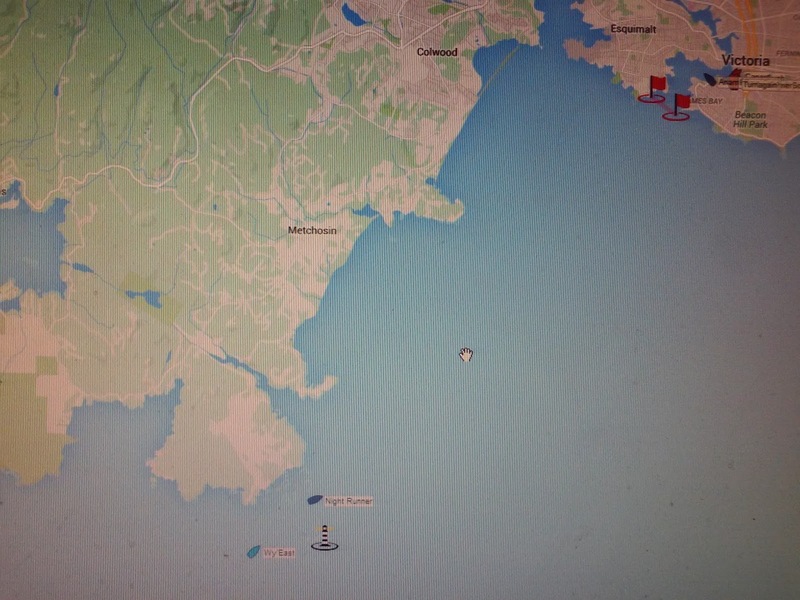 It was a great race, so we thought we'd isolate the tracks of these two boats to compare courses. Note that early in the race Raindrop broke right, and established an early lead....after that, Blade Runner spent much of the next two days following in Raindrop's wake....but just close enough behind to save their time! The 2016 CYC Oregon Offshore International Yacht Race featured three classic Cascade 36 sailboats, Raindrop, Bum's Rush & Wy'East. 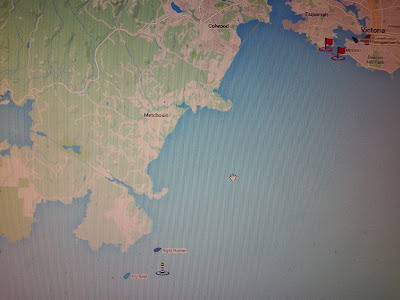 Although sailing in different classes due to rating considerations, no doubt these three boats were keeping a close eye on each other (as we were), and having their own "race within a race" for Cascade 36 line honors. The winner of this year's "Cascade Cup" (I made that up) was Raindrop, finishing first in Class B & 7th Overall; they corrected out to 2nd in Class B behind Blade Runner and placed 2nd Overall in the PHRF fleet. Check out the video of the Race Tracker following the three Cascade 36's up the course to the finish. 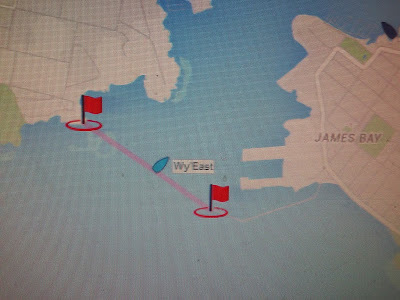 Note: Wy'East had some early transponder difficulties and were not reporting accurate positions early in the race....they didn't get a head start! There were lots of "races within the race" in this year's 2016 Oregon Offshore International Yacht Race, like this one between class A2 leaders Time Bandit, Panama Red, Anam Cara & Free Bowl of Soup. Watch the Soup "heat up" at the end of this track, just before the finish! Kinetic V vs. Rage - The Race Track...or, "Rage Against The Machine!" "Kinetic Rage"... I think I just found the name of my next boat! This short video compares the racing paths of the Wylie 70 "Rage" and the Transpac 52 "Kinetic V" during the 2016 CYC Oregon Offshore International Yacht Race, held May 12-15, 2016. 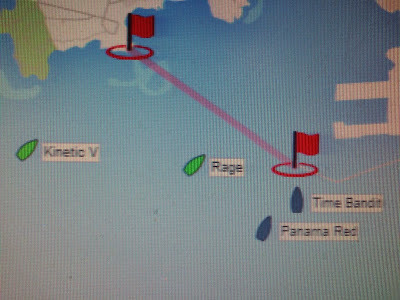 Rage eventually finished first by minutes, after Kinetic V sailed into a windless hole 100 yards from the finish; oh, it was in Canada... 91.44 METERS from the finish! Just wondering, how did they sail across the land at Sooke? Here's The Order Of Finish & Elapsed Times! Congratulations To Rage For Winning Line Honors! All seems right in the world when the biggest boat in the fleet finishes first; but it was close! We really would be remiss if we did not recognize the great race Kinetic V had... 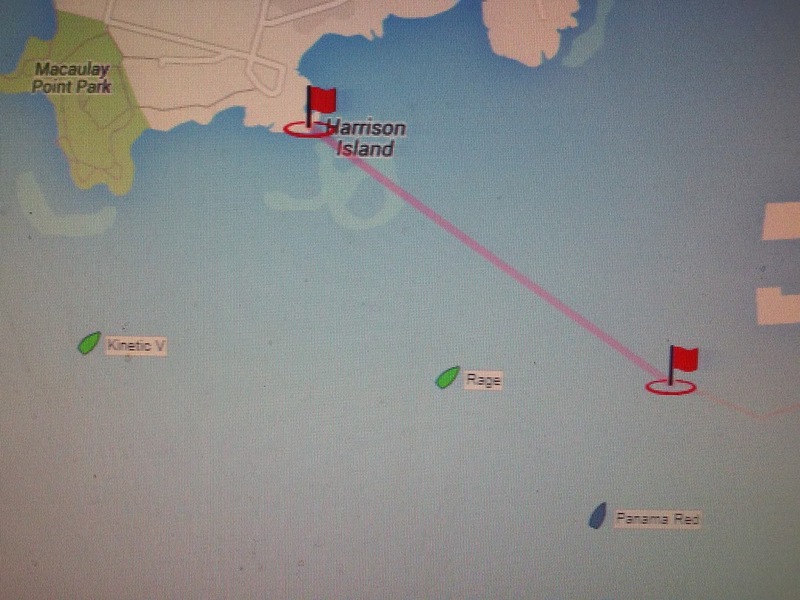 They led 99% of the race, only to sail into a monster hole 100 yards from the finish. Both Kinetic V and Rage had a wicked time fighting the ebb tide at Race Rocks... It really was the difference in the whole race! That allowed the A2 boats to come on strong, most notably Free Bowl of Soup, in full stealth mode, swooped in at the end with 5.5 knots of boat speed, caught up to almost everyone stuck in the hole, and saved their time handily... Mmm, Mmm, Good! Kinetic V, Rage, Anam Cara, Panama Red, Time Bandit, and even Free Bowl of Soup all had a chance at the line honors... 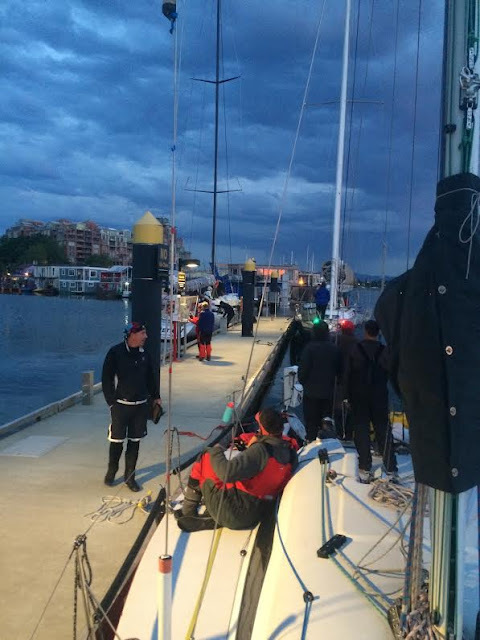 It was a great pre-dawn finish to the 2016 CYC Oregon Offshore International Yacht Race! 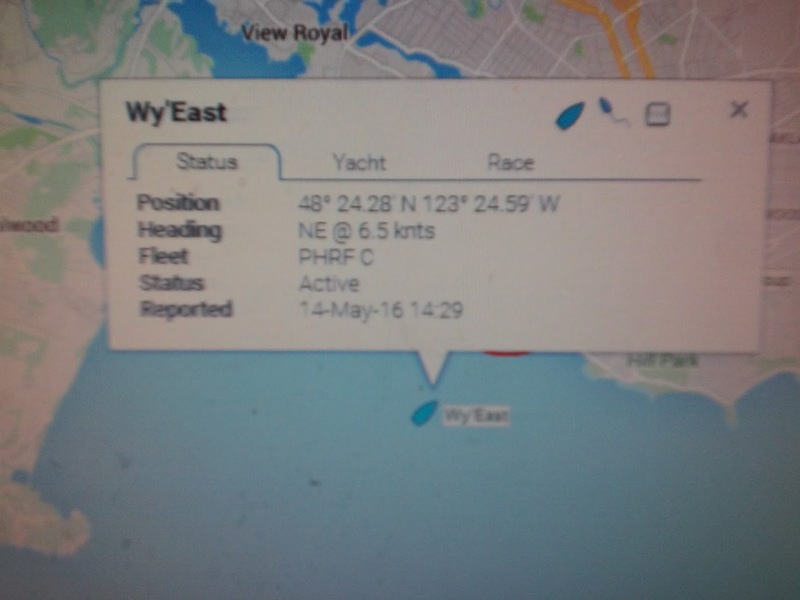 Here's a screen shot just before the finish of the 2016 CYC International Yacht Race! It was anyone's race at this point. Anam Cara is also just out of shot, with Free Cup Of Soup coming on STRONG at this point. The Soup was definitely cookin' in the home stretch! PHRF Corrected Time Standings - Congratulations To Overall Corrected Time Winner Blade Runner! Way to go Blade Runner! Overall winner 2 out of the last 3 years! I guess Fast IS Fun! Slow is fun too, when you win! Post race BBQ to be held at the Royal Victoria Yacht Club Sunday, May 15th. Come join us for food, fun, and awards. We plan to get those of you catching the 4pm ferry back to the states to the ferry terminal on time. With that, after nearly 64 hours of grueling racing, the 2016 CYC Oregon Offshore International Yacht Race is complete! Stay tuned for more photos, videos, results and updates on this blog and on the Oregon Offshore Facebook page as they become available. Thanks again to all of the competitors, spectators, sponsors and crew that made the 40th anniversary of the CYC Oregon Offshore International Yacht Race a HUGE success! We'll always remember this year's race as the year of the "Oregon Grinder"! BTW, can someone please turn off the Race Tracker when they leave?!? For next year, we're thinking about using a "Crew Tracker" for the post race festivities in town; now that would be interesting! Sign up for next year's 2017 CYC Oregon Offshore International Yacht Race to find out! Flamingo Chris... over & out! 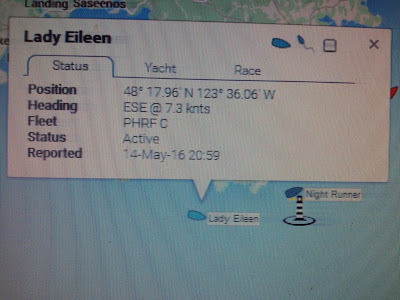 Even though the tidal flood has ended, there are still a couple of hours of slack tide before the ebb; that should give our last competitor Lady Eileen ample time to finish the race - assuming the evening breeze holds. Make haste, Lady Eileen, make haste! Your berth awaits! Our last finisher of the 2016 CYC Oregon Offshore International Yacht Race will be the Baba 30 Lady Eileen. She's trucking through Race Passage at the time of this writing... heading for the finish line and the wrap-up of this year's race! These guys should get some sort of endurance award! Great job, Lady Eileen. We'll be waiting for you at the finish line! Yes sir, yes sir, three sails full! Stay Thirsty my friends... Welcome to Victoria! If the wind holds, Lady Eileen should be in Victoria with the rest of the fleet long before the 10 am Sunday deadline. This is our last finisher folks, let's all root them on to a fast finish! 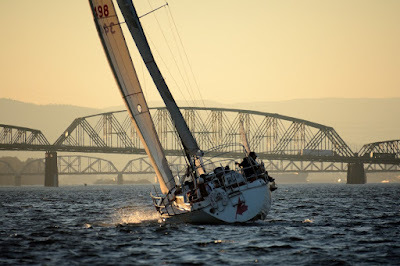 As sunset on Day 3 approaches, Thirsty is approximately 5 miles from the finish, currently steaming at about 6 & 1/2 knots, with winds holding at around 15 knots. 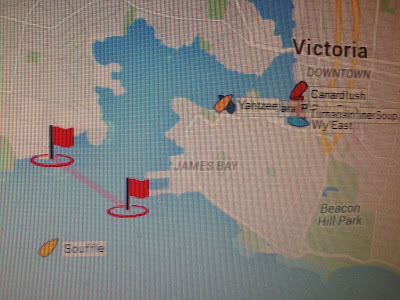 If the wind holds just a little bit longer for Thirsty, they'll be in Victoria Harbour in time for a late supper and a milkshake at Belthazar's.. Sunset's just minutes away.....Pour it on Thirsty! Oops, Cantata Appears To Have Finished - Tracker Error! The last position reading we have for Cantata is from one hour ago... Most likely Cantata has finished the race; we'll look for confirmation from the finishing team and report back. We blogged earlier about "ghosts" on the Race Tracker course... Night Runner and Cantata have both finished, but still show as "on course." 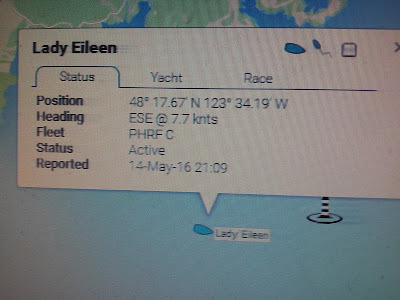 That leaves two remaining competitors, Thirsty & Lady Eileen...Thirsty still has about an hour of daylight but should reach the finish - regardless - sometime before midnight. 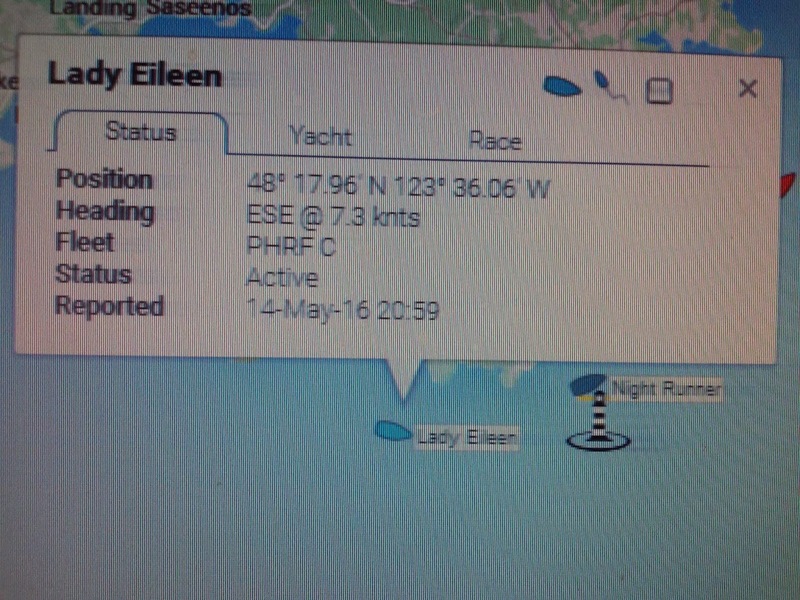 Lady Eileen has been making good time in the last few hours... Let's hope the wind holds! Passepartout & Aja Slip Between The Finishing Marks! 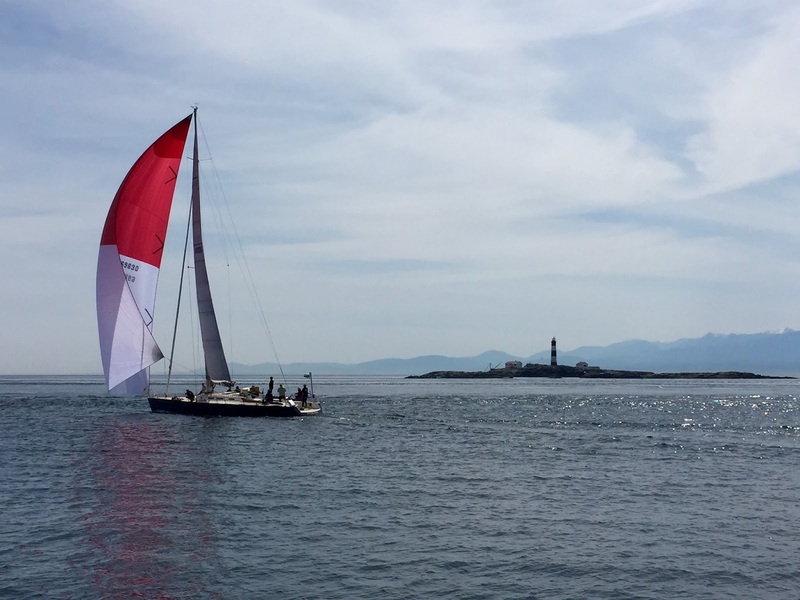 Passepartout and Aja have finished the 2016 CYC Oregon Offshore International Yacht Race. Like Music To Our Ears! Aja & Passepartout Ready To Finish! Aja and Passepartout are close to finishing... They'll be in port just before sunset on a Saturday night. It probably feels like they've been around the world in 80 days, but they've just completed another CYC Oregon Offshore International Yacht Race! Blue Martini has arrived. Welcome to Victoria! This is the first year that Blue Martini entered the race; we hope they'll come back again next year! Only five boats remain on the race course with just one hour remaining until sunset. Blue Martini is minutes away from closing time. It's a blast to the finish for these boats with 17 knot westerlies and a flood tide... Timing is everything! And here come Aja, Cantata, and Passepartout, right on Blue Martini's tail! It won't be long now before these boats are done with the 2016 CYC Oregon Offshore International Yacht Race! Cool Change just finished. Blue Martini is next. Welcome to Victoria, Cool Change! Makai Finished! Cool Change & Blue Martini Are Close Behind! It's a blast to the finish when the wind is up! I really feel bad for Kinetic V after watching all these fast finishes today. It's all a matter of timing I guess (and wind....and tide!). 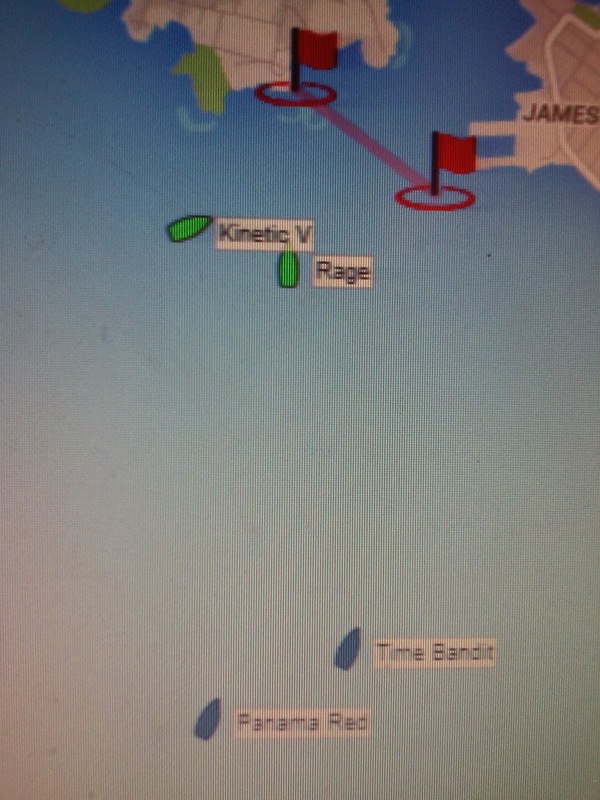 For those that don't know, Kinetic V was leading Rage to the finish line early this morning, but sailed into a hole that, eventually, cost them the race. They'll Be Comin' around The Corner When They Come! 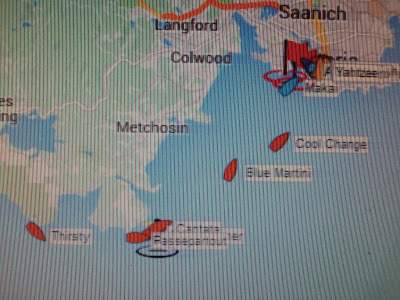 The last few remaining boats in the 2016 CYC Oregon Offshore International Yacht Race are closing in fast on the finish! First in line will be C fleeter Makai, now just a few miles away from the finish at Victoria Harbour. Makai is making great time, 7+ knots, and should be across the line within the hour. Following close behind Makai is Cool Change and Blue Martini, who have both passed Race Rocks and are heading for the finish at speeds between 6 & 7 knots. It won't be long now! At the turn, passing through Race Passage, are Cantata and Passepartout, making great time with lots of daylight left. Around the corner, close behind, is the C & C 35 Mark III Thirsty... Alan Bergen and crew are probably pretty thirsty right now for a dockside beverage after 2 & 1/2 days at sea! We'll keep you posted as the last boats cross the line and more pictures and videos from the racing come in! We've focused quite a bit in this race on tides, currents, and their effects on the racing fleet and tactics. First, we saw a huge tidal ebb flow out of the Columbia River "mushroom" for much of the start of the race. This allowed the boats on the northern edge of the fleet to benefit early with a lee bow push upwind, northwesterly, and out to sea. Then, last night, we saw the brutal effects of the tide and current change at Race Rocks, and how devastating the effects of combined light winds and strong currents can be, even on the biggest, toughest competitors. Today, it's a different story. We've got the last few remaining boats riding in on a nice gentle flood, or incoming tidal current. Today, the flood tide will help push the fleet towards the finish line until about 9:30 pm tonight, and won't turn to an ebb tide until after midnight. Given that there are still three hours of daylight left today, it's safe to assume that we should see most of the boats finish before midnight tonight. Then again... You never know. Lady Eileen better start leanin' a little more. IMPORTANT TO REMEMBER: The time limit for this year's race expires at 1000 hours PDT (10 am), Sunday, May 15th. 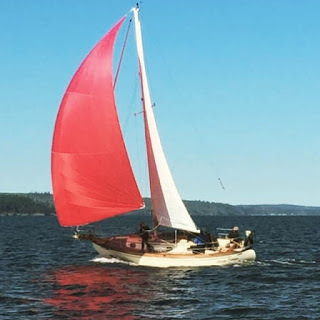 Makai, an Ericson 32 owned by Jack Coulter of Portland, has distanced itself from much of B fleet and is now closing in on Race Passage and the finish. Cool Change is nearby, taking a wide turn around Race Rocks... We'll see which strategy pays off. Behind the remaining leaders are Blue Martini, Aja, Cantata, Passepartout, Thirsty, and Lady Eileen. The time limit for the race expires tomorrow at 10 am; it looks like everyone is on track to finish well within the time limit. Well, except for Lady Eileen - it might be close for them - she better start leaning a little more! 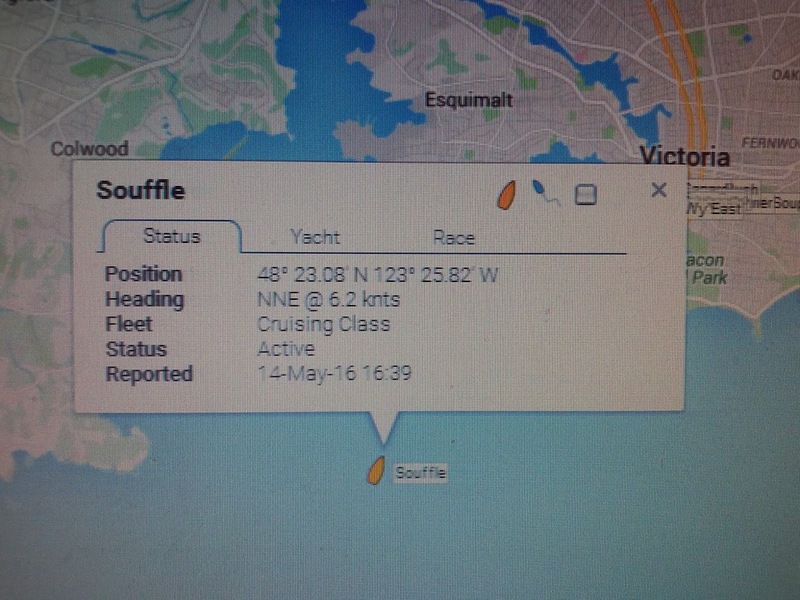 Souffle has finished the race! There are eight boats remaining on the course. No Chance This Souffle Will Collapse At The Finish! Souffle, a Cal 34 Mark I skippered by Philip Lewis, is close to finishing this year's 2016 CYC Oregon Offshore International Yacht Race. 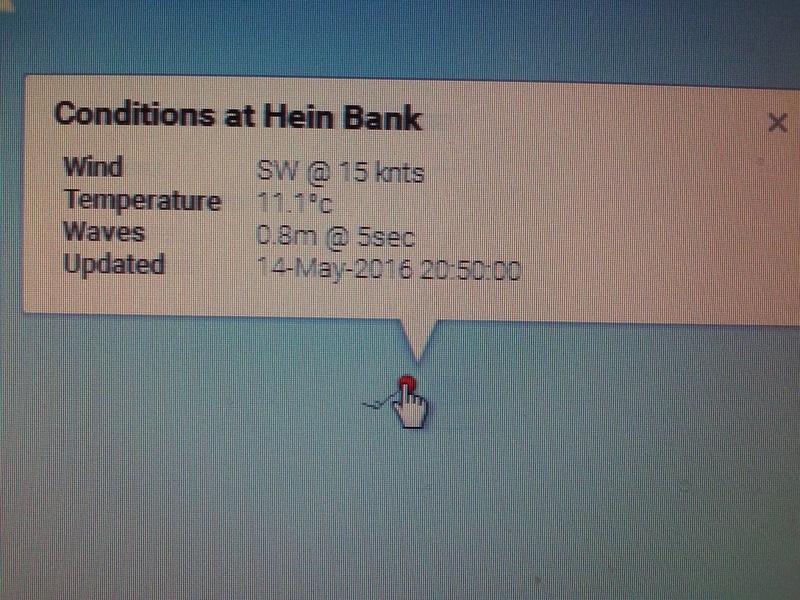 Moving along at over 5 knots, and less than a mile from the finish line, it's time to turn up the heat for a few more minutes, then voila! You're done! And just in time for dinner, too! 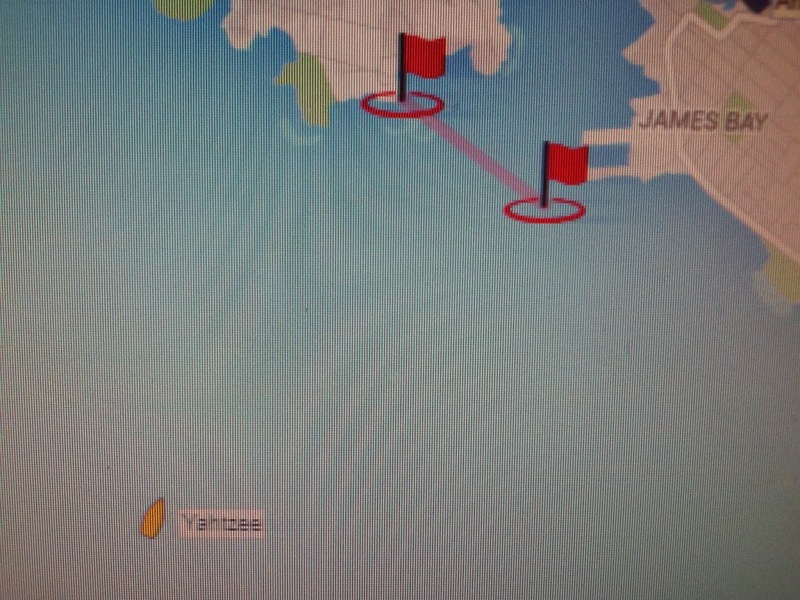 Yahtzee has crossed the finish line first in cruising division in the 2016 CYC Oregon Offshore International Yacht Race! Congratulations on finishing your first Oregon Offshore Race! Just because you're in the cruising class, doesn't mean you can't come smokin' hot into the finish! 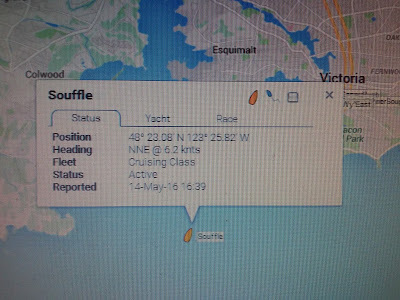 Look at Souffle, hitting 6.2 knots in the home stretch! Our compliments to the chef! Yahtzee Leaves Nothing To Chance & Rolls Towards The Finish With A Full House! 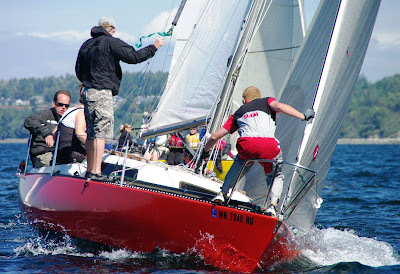 Yahtzee is a crowd favorite entry in this year's 2016 CYC Oregon Offshore International Yacht Race for a variety of reasons - kids on board, cruising fleet, new to the race... AND a great boat name! It shouldn't be long before this family friendly entry reaches their goal! For Those Who Missed It - Rage Takes Line Honors Again In The 2016 CYC Oregon Offshore International Yacht Race! 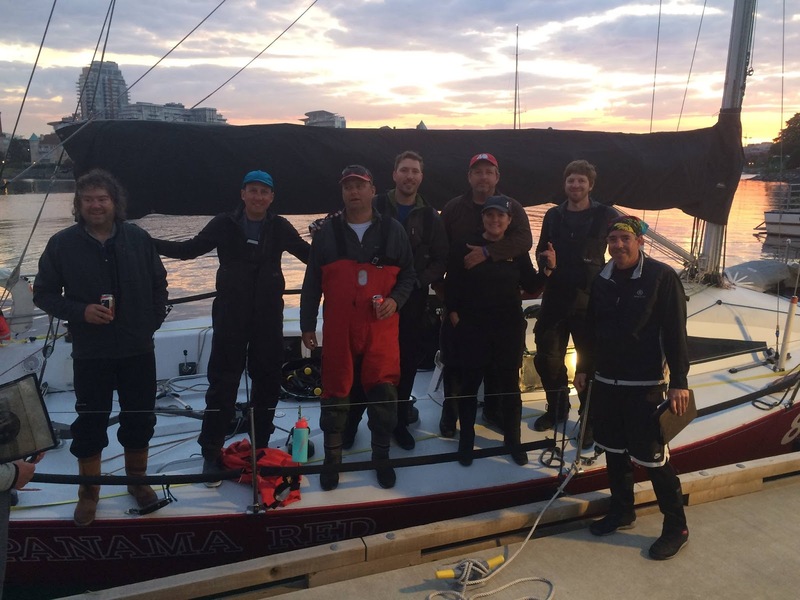 In what was a dramatic late night/early morning finish, Rage squeaked out a slim victory to take line honors in the 2016 CYC Oregon Offshore International Yacht Race! Congratulations to Rage and her crew for an exciting, hard fought victory! 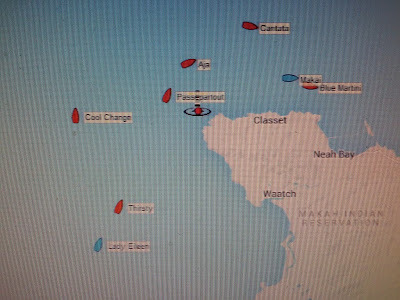 Cruising Fleet Glides Through Race Passage - It Won't Be Long Now! Cruising fleet entries Souffle and Yahtzee are finishing strong! 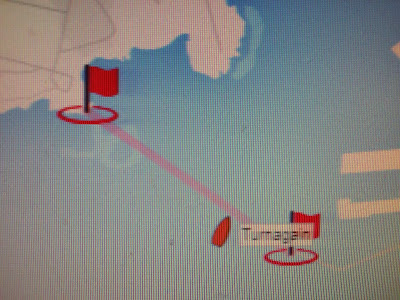 The only two boats in the cruising fleet, they are sailing side by side and have just now passed through Race Passage. It won't be long before they join the racers dockside in Victoria Harbour! Wy'East Finishes! Another Cascade 36 Returns To Victoria! 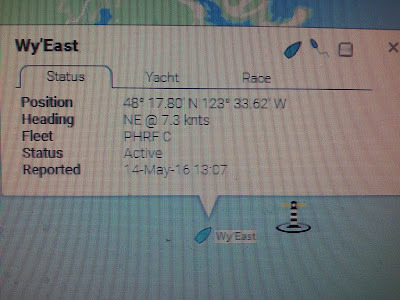 It looks as if Wy'East has made it across the finish line! Welcome to Victoria! You're just in time for tea! There are now fourteen boats that have finished the race, and ten boats remaining on the course. Let's wish them all fair winds at their backs for the remainder of the race! Wy'East Updates Their Position - They're Close To The Finish! 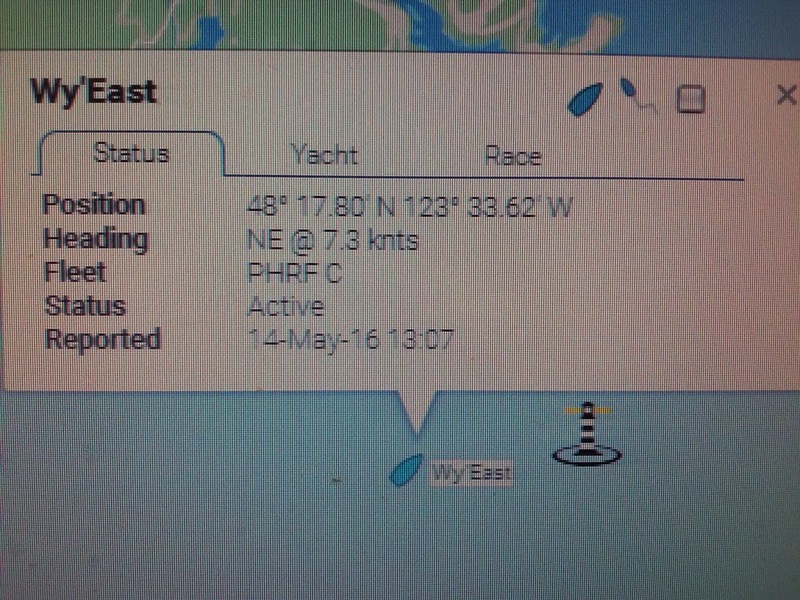 Just as we were wondering if Wy'East would update, we got this fresh new position just minutes ago. 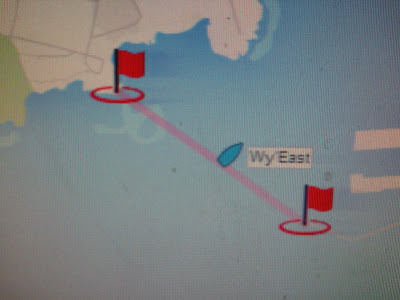 It appears that Wy'East has not yet finished, but her finish is imminent - within the next hour. Welcome to Victoria, Wy'East! Clipping along at a solid 6+ knots, cruising fleet entries Souffle and Yahtzee are now streaking towards the turn at Race Passage. We always like to say "you're never losin' when you're cruisin'," and these boats have weathered the 2016 CYC Oregon Offshore International Yacht Race in fine form. 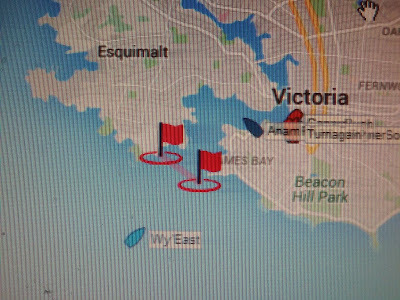 With just hours to go until the finish, these cruisers will be welcomed by the entire fleet upon their arrival in Victoria! 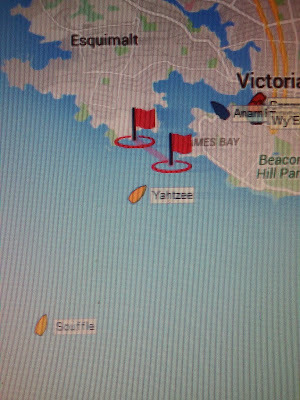 Two of the youngest participants in the race are sailing on board Yahtzee. What a great story this year's race will be for their grandchildren! Those boats that say they're there? Night Runner and Wy'East? Well, they're not really there. 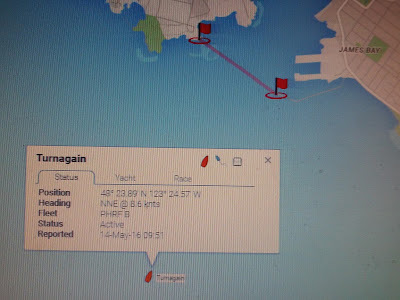 The Race Tracker onboard transponders have occasional "glitches" that make a boat appear somewhere it's not... or was... but isn't any longer... Make sense? In other words, always check the time of the position reading on the race coordinate pop-up screen to ensure you have recent data. The reading for Wy'East is about an hour behind her actual position right now, which is much closer to the finish. It might catch up - and it might not! Night Runner's position indicator puts them at Race Rocks for the last several hours, but we have confirmation that they've finished. 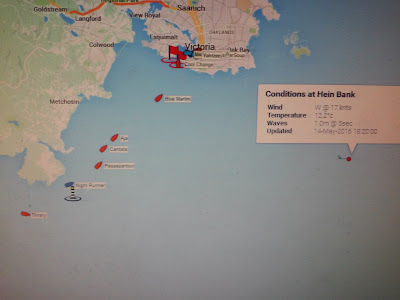 The finish team had a rather busy night last night, and no time to blog with boats stretched out juuuust enough to keep us up until mid morning waiting on the jetty. Starting around 0117, the finish crew got the call that the lead boats were around Race Rocks but going slow. Shortly thereafter came the hurried call that they were "making good time" toward the finish. Running out the door to be on station for finishers, we then watched the painful duel to reach the finish for just a brief 3 hours. First to finish was Rage shortly after 0427, followed closely by Time Bandit and Panama Red. Shortly thereafter came Kinetic V, and Anam Cara and hotly on their heels with building fresh breeze was Free Bowl of Soup. The wind continued to build quickly as the sun rose and a thunder storm rumbled out over the western reaches of the island and after a bit of a break we finished Rain Drop, then Hana Mari and Blade Runner, then Night Runner. It was a fun night, but the caffeine is wearing off and it's time to nap while we wait for the next cohort to make it around Race Rocks. 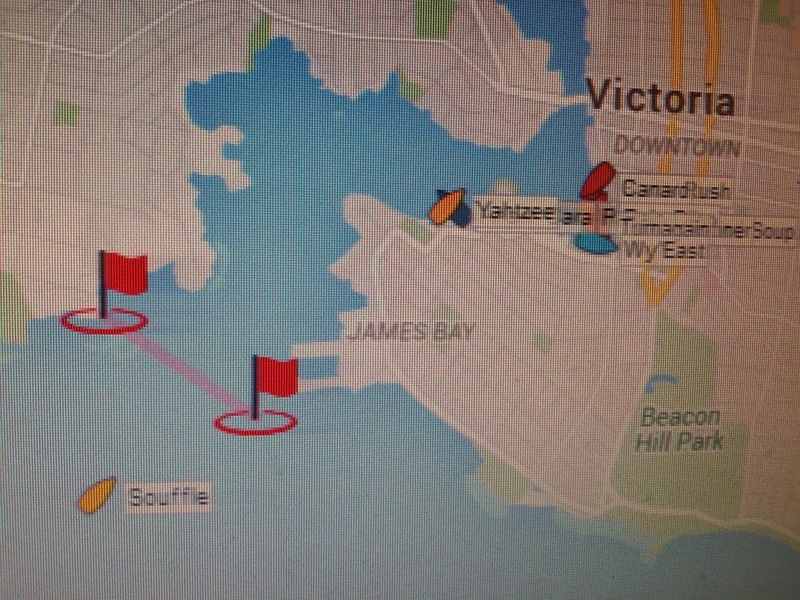 At 7.3 knots of boat speed, here comes another Cascade 36 Wy'East, rumbling towards the finish at Victoria Harbour. 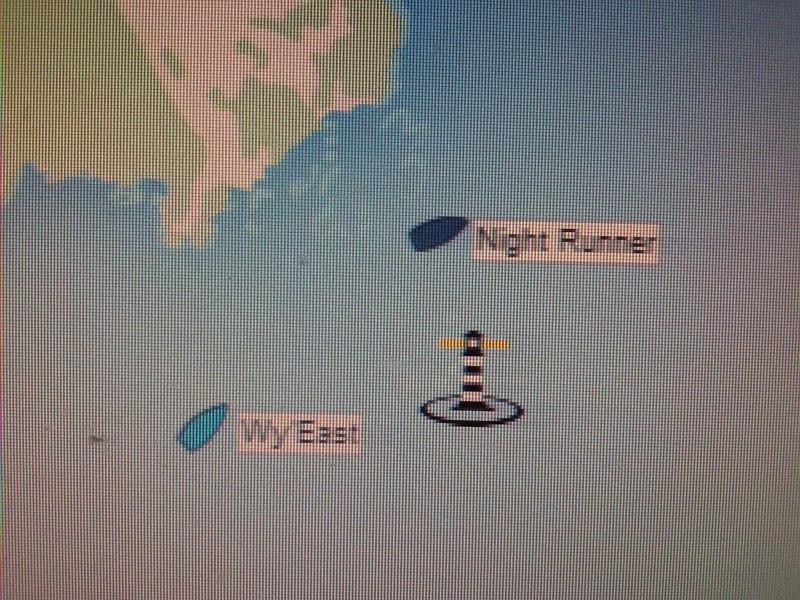 They appear to be close to passing Night Runner at Race Passage. We're not sure what's going on with Night Runner, but we assume a transponder issue is the culprit. 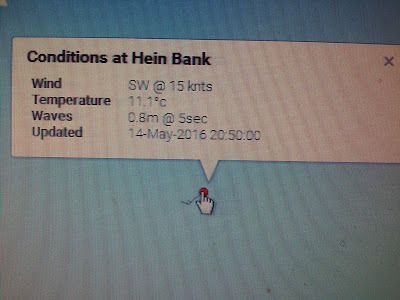 * WINDS...WEST 25 TO 35 KNOTS. We've had twelve finishers so far in the 2016 CYC Oregon Offshore International Yacht Race, and there are twelve more competitors still on the course, heading for the finish! 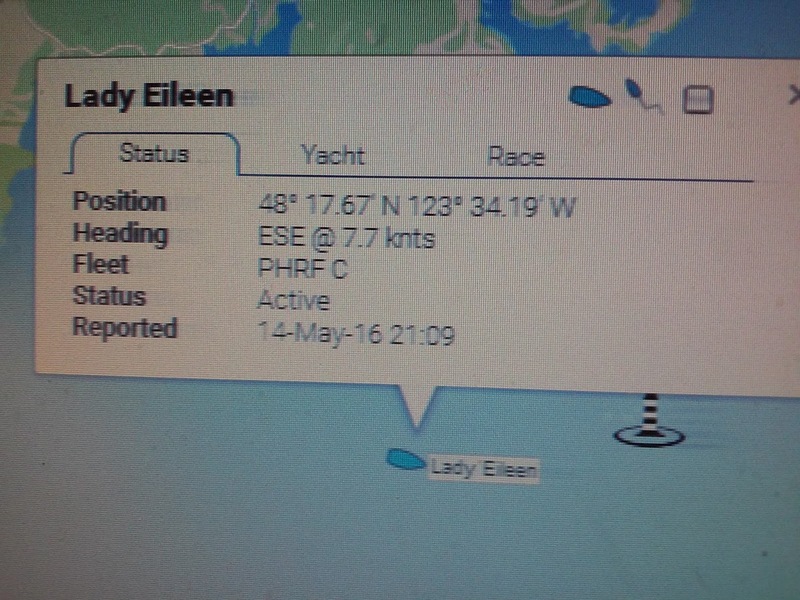 Lady Eileen and Thirsty have entered the Strait and have made the easterly turn towards the finish! It won't be long now before the 2016 CYC Oregon Offshore International Yacht Race is in the record books! Canard and Bum's Rush have now finished the 2016 CYC Oregon Offshore International Yacht Race! 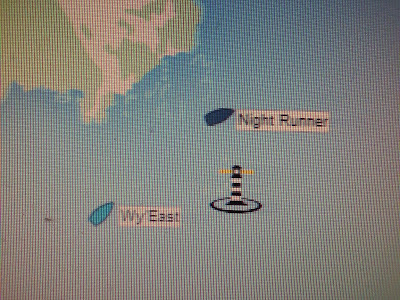 The next boat to approach the finish line will be Night Runner. Then, we'll have break for an hour or two before Wy'East comes rollin' along. 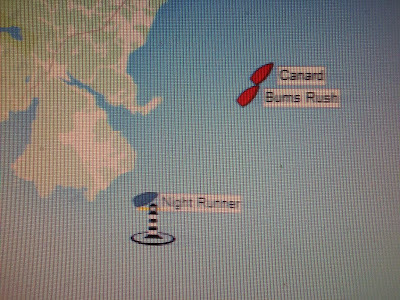 Congratulations to the captains and crews of Canard and Bum's Rush... Welcome to Victoria! 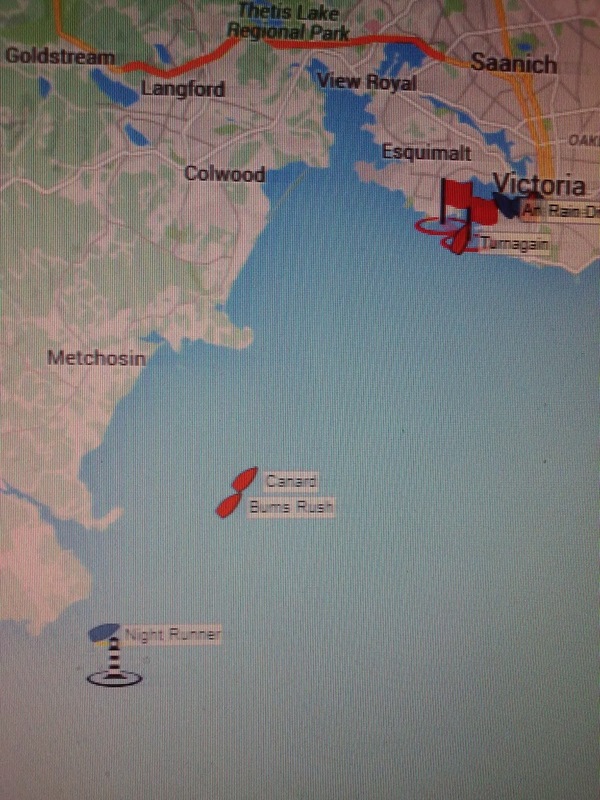 Three more boats have passed Race Rocks and are close to finishing: Canard, Bum's Rush, and Night Runner. 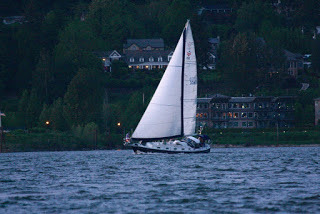 Night Runner was an early leader in the race by coaxing the fleet right towards the shore at Cape Disappointment. 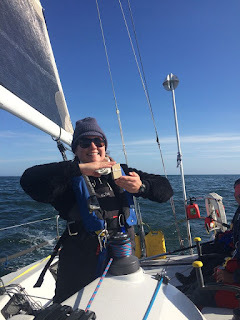 Let's say that again - TOWARDS Cape Disappointment - a gutsy move for even the most seasoned sailors. 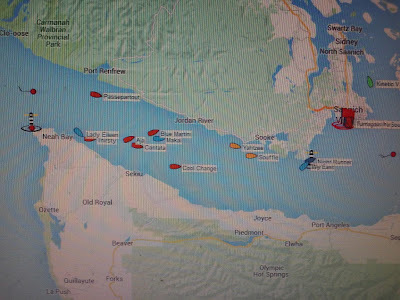 Leading much of the fleet up the Washington coast, Night Runner definitely had its admirers from the early goings of the race. 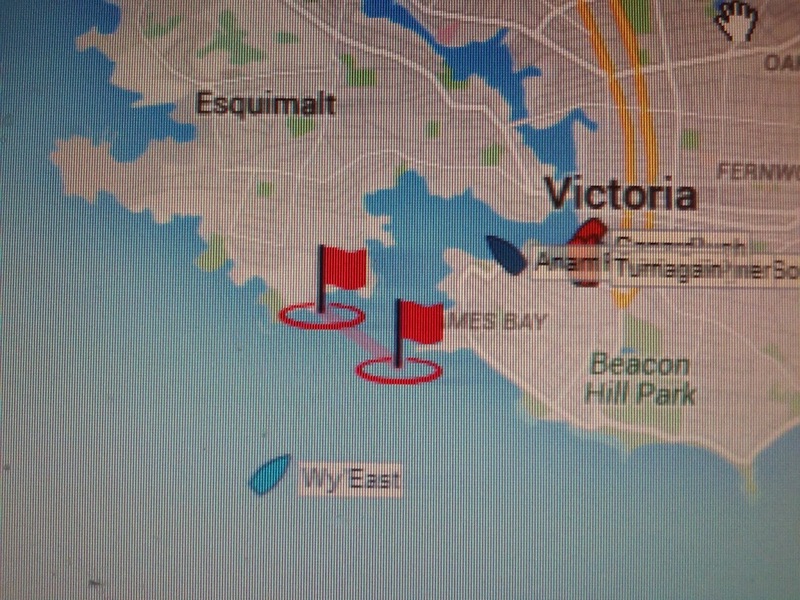 It looks like they ran into some difficulty last night in the Strait. We're not sure what happened there, but I'm sure we'll learn in time. Canard and Bum's Rush have stuck to each other like glue for much of the race. It's got to be a great feeling and spectacle to see these two fine racing yachts finish so close together after such a long grueling race. With 51 hours of racing under their belt and 24 hours to spare, Turnagain is happy to finish. Oregon Offshore Update - The 2016 Oregon "Grinder"! 24 Hours & 14 Boats Remaining! Well, it's been an interesting last couple of days on the water with the 2016 CYC Oregon Offshore International Yacht Race! So far, ten boats have finished, with 14 boats remaining out on the course. There are still 24 hours remaining in the time limit for the final boats to finish the race. 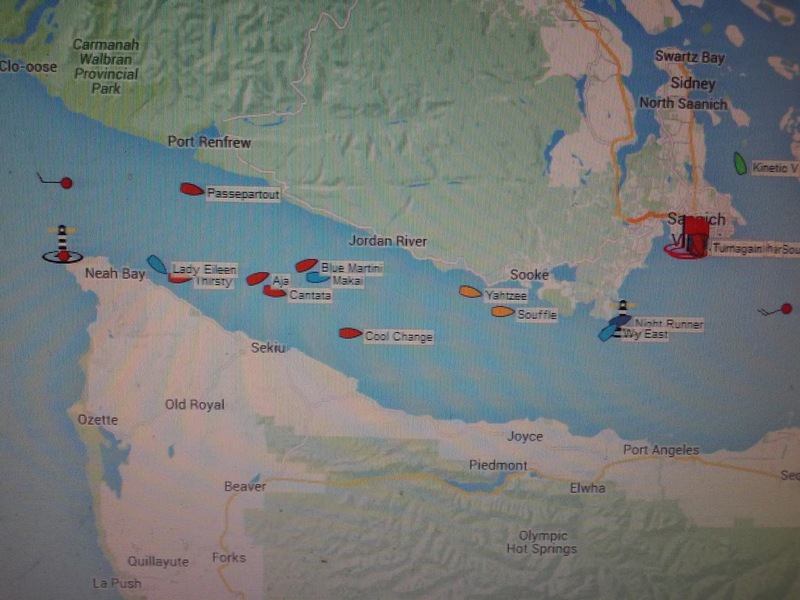 As the western end of the fleet rounds Cape Flattery this morning, it looks like all of the boats will have ample time and opportunity to finish! We're going to call this year's race the "Oregon Grinder" due to the extremely grueling conditions. I counted the tacks from one of the cruising boats on the first day of the race. I'll bet some of these boats haven't tacked that much in the past six months! From light winds to strong breezes, from winds on the nose for hours to winds from all over the place, to monster holes and wicked tides... It's been a real challenge to get to the finish this year. Congratulations to all of the participants in the 2016 CYC Oregon Offshore International Yacht Race! The Makah people and Mick Dodge must be getting a great view right now from Cape Flattery. Truckin' NNE towards Victoria at over 9 knots, Turnagain will be the next finisher in the 2016 CYC Oregon Offshore International Yacht Race. What a sight that must be! There's a fresh westerly breeze that's kicked up near the finish, providing a wild ride for the next few competitors and spectators viewing from shore. 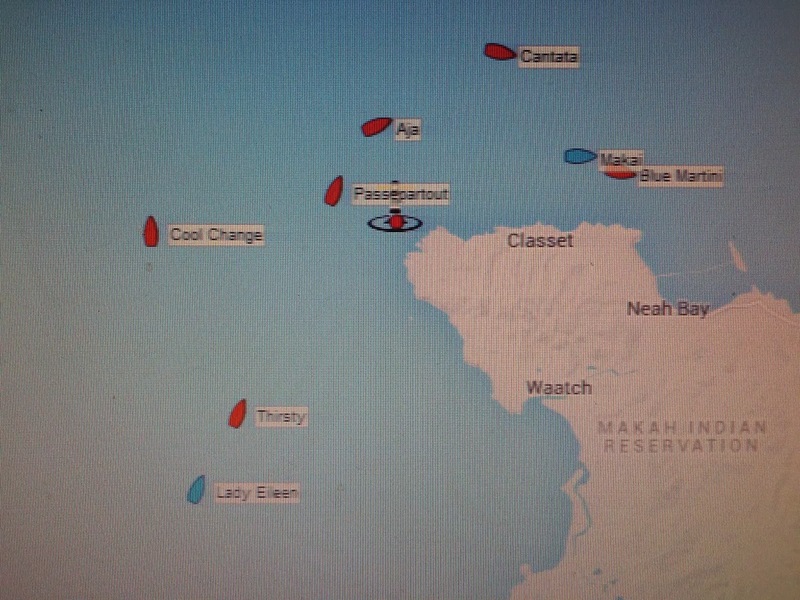 As the last of the A fleet boats round Race Rocks and heads for the finish, Turnagain is leading her pack. 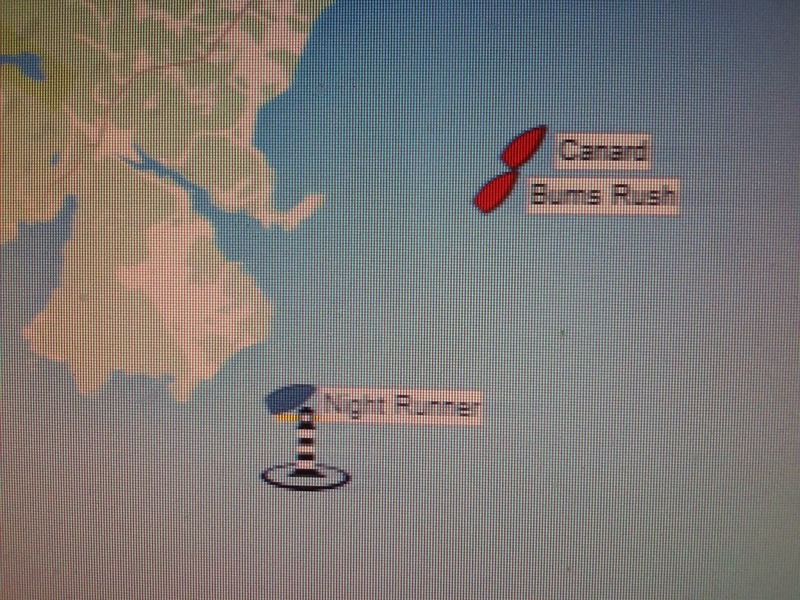 Night Runner had a great start to the race, but found difficulties navigating through the Strait last night. The final boats are just rounding the Cape and should be in the Strait before noon today. There is still more than 24 hours left before the time limit expires, and it looks as if everyone will make it across the line in time with some decent winds today and this evening. 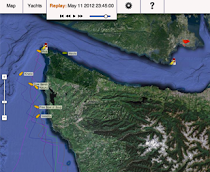 Raindrop has sailed a phenomenal race so far, and just recently shook off her pesky competition somewhere near Sooke. 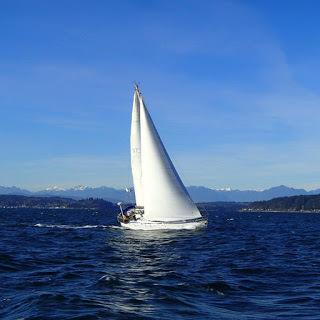 Now, set to round Race Rocks with a favorable tide and dawning daylight, Raindrop is poised to place well in this year's 2016 CYC Oregon Offshore International Yacht Race. 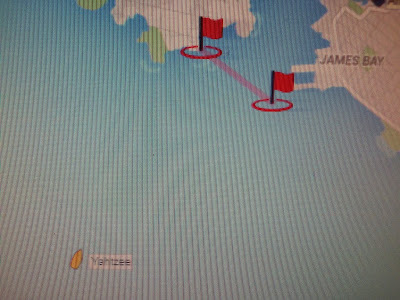 We'll let the CYC Finish line team update you on finish times and winners, here is a last screen shot just before the winner crosses the line... But, who's the winner? This is getting to be too much... Who's going to win?